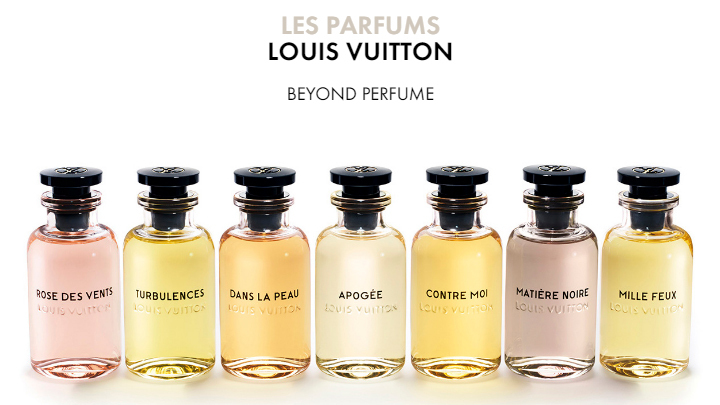 After 70 year of silence in fragrance sector, Louis Vuitton is launching the new capsule collection “Les Parfums”. The Louis Vuitton House unveils its creative workshop in the heart of Grasse, in the Provence region of France, the unique history of the House’s perfumer, Jacques Cavallier Belletrud. Luxury must not limit itself to offering what is rare and valuable: it must look toward the future. Jacques Cavallier Belletrud was not satisfied with simply creating an extraordinary variety of raw materials, but made improvements in them for more than four years. With the help of leading-edge technology, he has created his own vision of a dream palette. Just the beginning. Visiting the various Louis Vuitton workshops inspired Jacques Cavallier Belletrud to invent an infusion made to order. Fascinated by the subtleness of the House’s natural leather smell, Jacques Cavallier Belletrud requested an extract of this leather from the perfume workshop. Soft and sensual, it is like discovering leather for the first time. Cavallier Belletrud has had an interest in extraction with supercritical CO2 for some time. The process, which is already used to extract ingredients such as vanilla, does not require heat. When bathed in cold gas, the plants unleash all their subtleness. Jacques Cavallier Belletrud decided to test this technique on fresh flowers. The scent is so pure, so elusive, that it makes you feel like you are standing in the middle of a field of flowers in Grasse. The may rose and jasmine extract made with supercritical CO2 is not only a world-wide novelty but also an exclusive of the Louis Vuitton House. SwO magazine suggests you buy it HERE.